Friday is my favorite day of the week. ﻿It always has been, although now more than ever. Each Friday Eve (Thursday night), I tell Waverly Maye that I get to spend the following two days uninterupted with her. I get to be the first face that she sees, share in her constant happy morning mood, and feed her cereal for the first time of the day. I love it and look forward to it, with the only downside being realizing what I miss during the week. This Friday definitely couldn’t come soon enough, and honestly not for the best of reasons. This hasn’t been the easiest week for us. As previously posted, we have had a bit of a sleep issue (actually, sleep as been pretty non-existent.) Furthermore, I have come down with a sinus infection, my students have been driving me crazy, and we have had two sick babysitters. And on a side note, my “quick run into” Kroger on Wednesday ended up lasting over an hour. After dropping my cart & all the groceries into the parking lot, my keys were no where to be found. After walking around Kroger at least five times and eventually resorting to digging out my hide-a-key, Kroger called to explain that the man who had helped me pick up my groceries had accidentally left with them. Really? We had to drive across the city to recover they keys. That face. Waverly’s PJs are from Zulily and headband is from JoAnne Fabrics. She’s ready for Valentine’s Day. Valentine’s Day is exactly one week away, and my heart can hardly contain all of the excitement. It’s pretty obvious that I love any excuse to celebrate, and I try to take advantage of every opportunity I get. And now that Waverly Maye can partake in of all the fun, my need for “festiveness” is totally on another level. My head has been in “Valentine’s Day” planning mode ever since the day after Christmas. Even though I know Waverly Maye won’t remember this year’s celebrations, it is her first, and I want it to be extra special (just like her.) So I got lots of heart-adorned outfits & accesories, some pink & red decorations for the house, and purchased some cute little goodies for a V-Day themed basket. 1 – Peek-A-Boo Board Book; We are really trying to get Waverly into a good bedtime routine that includes reading books each night. Yet since at this point, she still would rather eat them than anything. So the board books are definitely the way to go. She will find two “love-themed” books in her basket on Valentine’s Day. 2 – Red and Pink Hearts Ribbon Garland; I love garland, and find a reason to hang it for pretty much every season. Even though I could be really domestic and make it myself, buying it for $3.00 seemed to be the better option. 3 – Intarsia Heart One-Piece; Baby Gap clothes seriously make my heart happy. I try to contain my newfound NEED for them and only get them on sale, but I make an exception for holidays. 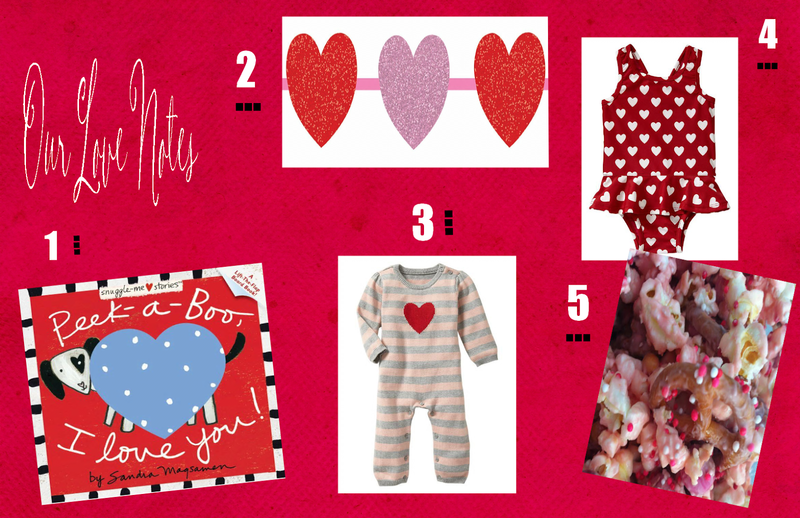 Waverly’s First V-Day ensemble will be this sweet one-piece from Gap. 4 – Heart Ruffle One-Piece; OK, so I made another exception to add to Waverly’s basket. I felt that it was ok since she is going to NEED bathing suits for this summer, and the hearts made it fitting for the occasion. It was practically a no-brainer. 5 – Cupid’s Crunch; Although I will admit that my husband definitely cooks WAY more than I do, I like to bake. I think it’s something about the creativity, sweetness, and making the final product look pretty. So I (like always) turned to Pinterest for a pink treat we could bring to our loved ones. So those are Our Love Notes – some of the special little details to our Valentine’s Day this year. 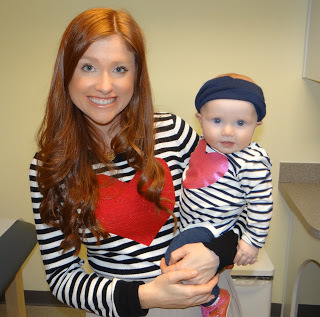 Waverly’s headband is from Gap, outfit from Zulily, and boots from Old Navy. It’s a good thing our Stylish Sweetheart is super cute (see below), because she sure is causing some sleepless nights in our house these days. All of those books I read were definitely correct, as it seems that just when we have our routine down, Waverly Maye just isn’t having it anymore. I’m pretty sure that she just likes to keep us on our toes … she is just too animated & has too much personality to do anything but that. Predictable? One word I wouldn’t use to decribe our baby girl. I can’t complain too much, as I’ve heard more than enough stories from moms who didn’t sleep for the first year. Waverly has pretty much slept like a rock star for the past couple of months. Although I knew it was more by chance than anything, I felt like a pretty accomplished new mom each night as she laid in her own crib in a peaceful slumber. It really did look like the movies for a few nights. You know, I kissed her forehead as the lullabies from her sleep sheep played sweetly. These nights? I certainly wouldn’t describe them as calm. In fact, the words turbulent or rather rambunctius would be a better fit. Waverly does not seem to want to sleep in her crib, and although we can get her soundly sleeping while holding her, the minute we lay in her down, she makes it quite clear that she is not happy to be there. We have tried everything. 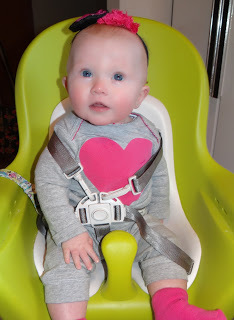 The (magical) sleep suit, bigger meals before bed, extra pacifiers, repeats on the sleep sheep… We have let her cry (maybe the hardest moments of my life EVER), rocked her endlessly, and fed her. And YES, I admit it. I have snuck her into bed with me on more than one occasion, even though my husband was totally against the idea. I knew being a mom wasn’t going to be easy. And this whole sleep situation is definitely proving to be one of the hardest parts. But, when I look at that little face (again, see below), it is MORE than worth it. 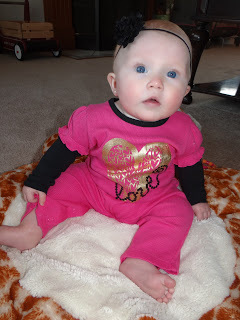 Onsie & Pants are from Carters, and headband is from Etsy. 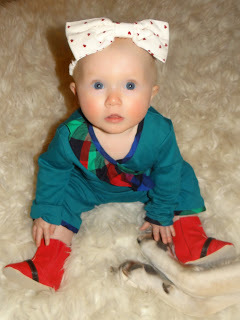 Outfit is from Babies’R”Us, and headband from Etsy. football wear for today’s Super Bowl. I have to be honest … and I’m sure my confession is of no surprise to anyone. We don’t follow NFL football, don’t really care who wins, and furthermore, didn’t know who was in the game until a couple of days ago. 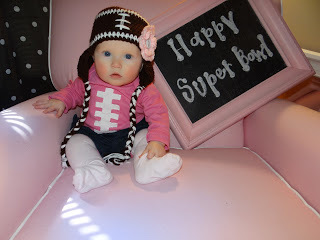 But Super Bowl Sunday is practically a holiday, and we won’t let any of those go by without dressing in theme. Happy Super Bowl Sunday. Good luck to both teams (who I do now know, by the way … are the RAVENS & the 49ers.) Waverly Maye will be watching in style. Waverly’s hat is from Etsy (Enchanted Kraft Garden) & onsie is from Etsy (Klzart.) Her shorts are from The Children’s Place & tights are from H&M. 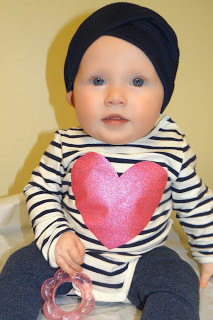 We will be back tomorrow with some more Stylish Valentine’s looks from my little sweetheart. I know I am not the only mom who has a new appreciation for holidays now that I have a child. Each holiday since having Waverly has definitely taken on new meaning. And even though I realize she won’t remember much from the celebrations this year, I can’t help but take advantage of every festive moment with my sweet girl. Valentine’s Day will certainly be no exception. 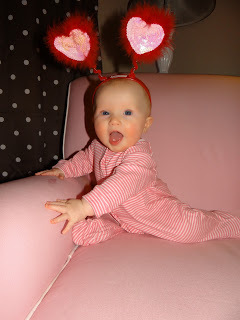 I have already ordered a few lovable goodies for my little sweetie, decorated the house with red & pink touches, and (of course), created quite the collection of “heart” attire for Waverly Maye. 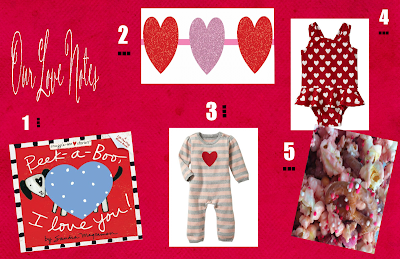 So much like my Chic Christmas Countdown – starting today, I will adorn my Stylish Sweetheart in Valentines-themed fashions.